The market for electronic pipettes has grown considerably and now offers a variety of different options catered to different laboratory needs. Whether you want precise volume dispensing control, ergonomics or both, there’s something on the market designed just for you. 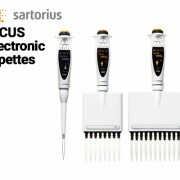 Biohit Picus pipettes in particular offer a level of comfort and control not found in other products and create some of the highest quality pipettes in the industry. Is my experiment large or small scale? Will I be dispensing into multiple tools? Will I be using a pipette for an extended period of time? Your answers to the above questions will help you narrow down your choice to the two main types of electronic pipettes, which be discuss below. Multichannel pipettes are ideal for larger scale experiments and allow you to increase your laboratory productivity by minimizing the amount of steps taken during the pipetting process. This allows you to cut down on the time consumption of your projects and get accurate results in a more efficient manner. For those looking to dispense specific volumes of solution into multiple tools without having to aspirate, our repeater pipettes are the way to go. These unique tools offer plenty of benefits over standard mechanical pipettes. At Pipette.com, we have seen the growth and expansion in the market for electronic pipettes and know which brands and products have grown along with it. 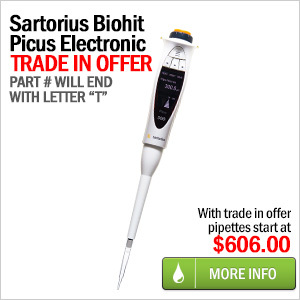 With trade in prices these amazing Picus Pipettes are currently starting at the low price of $606.00. 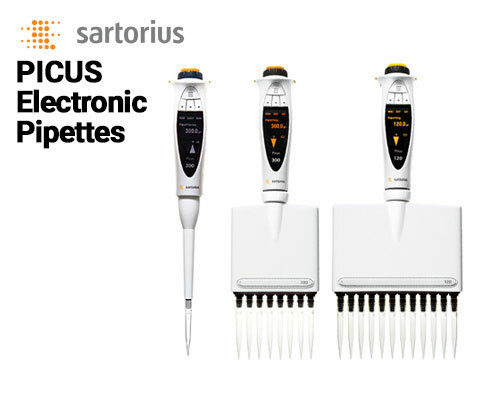 Take a look at our Picus pipettes today and we’re sure you’ll find what you need.